Tempted Tuesday is usually about things (decor, style, clothes, jewelry) that are awfully tempted to buy. Recently I've been featuring things that are still tempting to buy but I've now added a part of it that involves a DIY. I am going to start calling those posts Worth the Buy, but Tempted to DIY. This post is just that. First is the All Seeing Eye bracelet. By making a few little beaded chains, you can replicate this pattern or create your own. Grab a piece of graph paper that is a few rows long (about 4 or 5 squares or longer if you wish). Start at the middle mapping out the pattern like the image to the right. Now you can follow the pattern to make the rows of beaded chain. You may have to cut or add to your design to make sure the bracelet fits around your wrist. You can find bars to hold the multiple chains at the craft store in the jewelry department or search on ebay/etsy/amazon for the perfect fit. The Strawberry Lemonade Necklace can be made with acrylic or glass faceted beads. 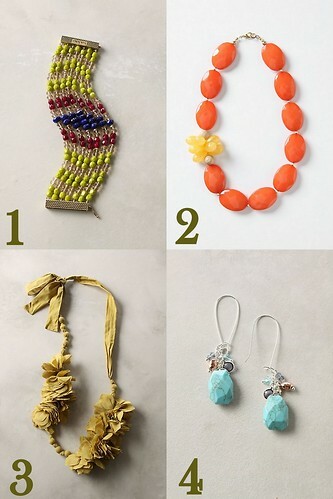 Create the yellow accent by stringing drop beads on and pushing them together. This will create the flower effect. Finally these drop earrings (Stone Mine Drops) can be personalized with a certain color bead. Put smaller accent beads on the same type of head pin as the large bead & connect them to the earring fish hook.